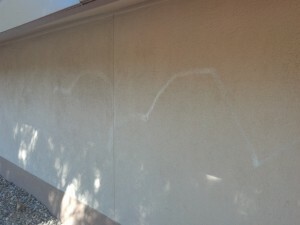 ST. GEORGE – Vandals struck a proposed residential drug and alcohol recovery center in the Bloomington community of St. George on Wednesday night, damaging both the home, as well as a trailer belonging to a contractor hired to help remodel the home. While residential drug and alcohol treatment centers are rarely greeted with open arms when they first appear in a community, in Bloomington, opposition may have crossed the line from civil dissent into malicious destruction of property. In Payson, a similar residential facility is owned and managed by the same people, yet every neighbor that St. George News spoke with said that their worries vanished as they soon began to view the residents of the facility as neighbors rather than interlopers. The Bloomington house is currently undergoing renovation into an eight-bedroom residential facility. It has recently been the subject of controversy ever since it was purchased by Steps Recovery Center in June. Many residents in the neighborhood have held meetings to organize their efforts to stop the placement of the facility in the affluent community. The group swarmed a town hall style meeting with U.S. Rep. Chris Stewart last month and demanded that Mayor Dan McArthur and the city do something to stop it. Residents had hoped that the city would deny the zoning variances that the center needed to operate the 24-bed facility originally planned for the property. Denying the variance would have likely violated the Americans with Disabilities Act, which provides legal protection for residential treatment facilities. However, the owners of the recovery center sidestepped the city by limiting the facility to eight beds, which is already allowed under current zoning regulations. Mike Jorgensen, co-founder of Steps Recovery Center, said he worries the vandalism might represent an escalation in the neighbors’ efforts to stop the facility from opening in December. “It’s all over the sides of the building,” Jorgensen said. Police described the chemical that the vandals sprayed as a foamy substance which has left long, discolored streaks across the stucco siding of the house. Jorgensen said he believes that the entire house will now need to be repainted, which he expects could cost more than $2,000. On Oct. 6, Jorgensen said that the night watchman chased away trespassers after he overheard people prowling around the the yard late at night. “He overheard somebody talking about burning the house down,” Jorgensen said. He filed a police report, but he said that police have not yet identified the prowler. A week later, the same night watchman chased away a group of teenagers who were strewing toilet paper across the property. One of the kids dropped his cell phone as he ran, Jorgensen said. It was soon discovered that one of the pranksters was the son of Warren Church, a vocal leader of resistance efforts in the neighborhood. “One of the other boys called and apologized to me,” Jorgensen said. “He told me that one of the parents had put him up to it.” Jorgensen asked the boy if it was Church who told them to toilet paper the trees. The boy was silent for a few seconds, Jorgensen said, before telling him that he didn’t want to say who put them up to it. Many of the neighbors are quite angry, Church said. “It doesn’t surprise me that somebody would want to take matters into their own hands,” he said. He recalled that, at a meeting held in August, audience members discussed harassing the contractors who were hired to remodel the house. “I remember the hostility of somebody in the crowd who wanted to know the name and number of the contractors,” he said. At the Aug. 2 meeting at Bloomington Elementary, Church had the microphone when the discussion turned to harassing the contractors. Church responded by saying that it wasn’t an appropriate course of action for the group they were forming. “That would have to be a personal agenda for you,” he said. 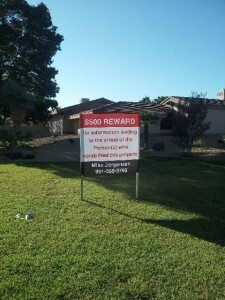 Jorgensen has placed a sign in front of the house offering a $500 reward for information leading to the arrest of the person who vandalized the property. Warren Church and other neighbors have said that the sign is in violation of city code and they want it removed. The Bloomington residents have asked the city to force Jorgensen to take down the sign, Church said. “Somebody in our neighborhood sent an email to the mayor,” he said. “The mayor replied, ‘yes, I see this as a problem. We will send out code enforcement officers right away.’” Church said that he had a copy of the email but that Bob Cheek was the neighbor who sent it. The sign reflects poorly on the neighborhood, Cheek said, where homes routinely sell for more than a half-million dollars. “There’s a $500 reward sign. How does that make the neighborhood look?” he asked. “It makes it seem like we have vandalism in the neighborhood.” Cheek said that yes, he did send the email, and that McArthur said that he would take care of the problem. The challenge to his reward sign wasn’t the first encounter Jorgensen has had with the code enforcement division. After his night-security officer chased people off the property twice in one week, Jorgensen reported the incidents to the police. The next day, he said, his attorney received an email from the City of St. George Deputy City Attorney, Paula Houston. ED. CORRECTION / CLARIFICATION (Nov. 2, 2013): This report as first published erroneously stated, above, that Jorgensen said that the next day he was called by City Attorney Shawn Guzman. To correct and clarify: Jorgensen said that the next day his attorney, Gary Kuhlmann, received an email from Deputy City Attorney Paula Houston concerning the matter of someone living on the property. The man then residing on the property was paid for caretaking services, Jorgensen said on Nov. 2, and was not charged rent or given board in exchange for services. “That’s considered rent,” Mortensen said. Jorgensen said that he has been through this before. The house in Bloomington will not be the first Steps Recovery Center location. Jorgensen and his partner, Christian Smith, opened their first residential recovery center in Payson in 2009. Jorgensen remembers that many residents in the Payson neighborhood shared some of the same concerns as those in Bloomington. On snowy mornings, Bingham said, the residents at the facility are out in the street, shoveling the neighbors’ cars out of snow drifts. At the house next door to the Payson treatment center, Chad Farr said that when the community discovered that a recovery center was coming to their neighborhood, they organized to try to stop it from opening. A man named Coulson said he thinks that there is actually less crime in the immediate neighborhood surrounding the facility. “At night time, the whole place is lit up,” Coulson said. The light isn’t so bright that it’s a nuisance, he said, but enough that you can see your yard clearly. “It’s like on a moonlit night,” he said. “At least in our area, crime and stuff has gone down,” Coulson said. I know there is a fear factor because people have a stigma about what kind of people it will bring in, and how people are labeled, and what they feel drug addicts look like, and what type of people they are. These people that have been in this program have not been who we thought they would be. They’re just people trying to make their lives right again; and we haven’t felt it was a problem in any way at all. Except that we were frightened at first, also. St. George News reporter Tracie Parry, contributed to this report from Payson. How does this behavior from the residents coincide with their self righteous attitude? Enlighten me. First, let’s all assume that A Bloomington resident did the vandalism. After all, it couldn’t possibly have been a drug addict that was unhappy with his treatment in Payson. It couldn’t possibly have been one of Mike Jorgensen’s shady business partners. Nor could it have been random violence towards an abandoned home. However, assuming (as you have done) that it was a Bloomingon resident, why is it self-righteousness to not want a drug rehab center ( a business) ind residential neighborhood? Let’s have some intellectual honesty. No one wants a business near their home. It really is that simple. Gas stations are needed to , but I would not want a Maverick built next door. Just wow! People are so ignorant and hateful it’s distgusting. This article is what is disgusting. It tries to convince everyone that people in Bloomington are hateful without having facts about what happened. Then tries to make Warren Church the bad guy, for trying to stop the good guy, Jorgensen, from only putting in an apartment complex full of people with drug habits. The city would sue an apartment owner for renting to them but i digress. So this horrible Mr. Church doesn’t want this place next to him and even offered to buy house, but good guy Jorgensen, who only wants to help people, well, except for the people in the community that have lived there for 20 plus years. If only there were not those pesky facts, like 10k per month each drug user pays or the state pays for them, making 24 users pay Jorgensen 2.4 million per year. Next time you judge Bloomington, make sure us want to make a guy rich by ruining a neighborhood exploiting a law never meant for this. Jorgensen was offered money to leave, was given six other better locations to set it up. When was the last time you saw a 20 million dollar business set up shop in your neighborhood, oh right, it illegal, well except when you exploit laws meant to help the disabled. This author of this article should be ashamed of himself. Classy, real classy Bloomington residents. StG residents being closed minded and hateful. Shocking. Really. 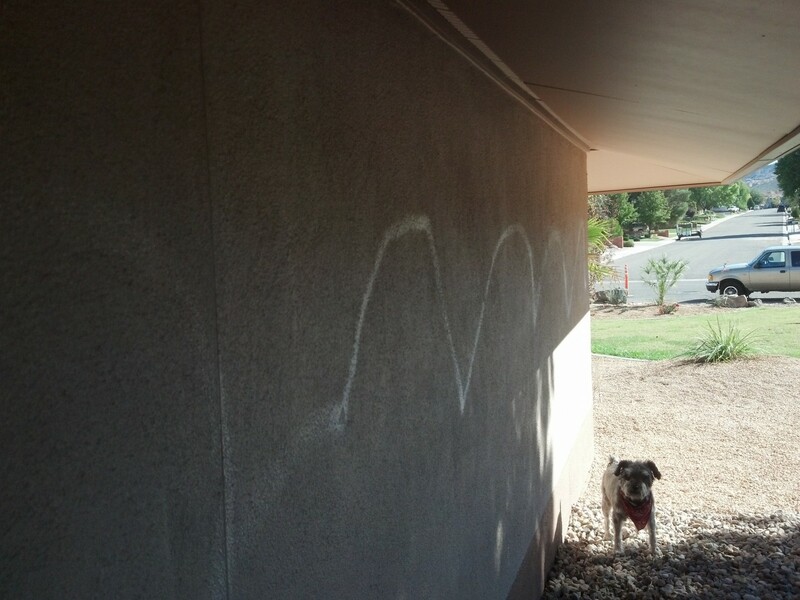 Sad that a select few have found vandalism as healthy, mature way to problem solve. Even more interesting is the fact that everyone, and I mean everyone on this ball of mud called Earth has a loved one ho struggles from addiction. Could be a mother, father, sister, brother, aunt or uncle, cousin, grandparents friend, everyone has someone that struggles. Any educated individual understands they have the freedom to choose their attitude in any given set of circumstances. Educated people everywhere understand this as they see the challenges in their life as opportunities – not as bringing opportunities, but as opportunities in and of themselves. What Mr. Church seems not to understand or refuses to see is other people’s problems are our opportunities. Finding ways to create value for others by helping them through their own hard times is a key to prosperity. He and others who fear this kind of stuff should invest in getting to know what is really happening, not what they fear could happen. Good luck STEPS, hundreds of valuable people and their family’s will be saved by your actions. It’s unfortunate that the irrational behavior of a few would tarnish the positive collaboration of a supposedly family friendly community with a great service for those that are looking for nothing more than a place to overcome their struggles with peace and dignity. In my experience, you’ll find that the future residents of the house that was vandalized will be more forgiving than those in the neighborhood who are aggressively attempting to prohibit this house from becoming a reality. Having worked with troubled youth for over 15 years has helped me overcome a lot of prejudices and misconceptions about those who struggle with the “formalities” of life. They’re not just people with issues, they’re my brothers and sisters, and I embrace them. They are some of the bravest people I know, facing real life or death challenges, something the regular Joe will never fully comprehend – they are only looking for a fighting chance, who am I to deny them that. Being far from perfect, who am I to judge them? In this era where we see a lot of Me, Me, Me, in society…we forget the opportunity to love our neighbor. They say you can tell a lot about the character of a man by the service he provides those who do not have the ability to return the favor. The fear of the unknown is very understandable – however when we have the courage to venture outside of our comfort zone we find our lives have become enriched beyond compare. We could easily cast lots for both sides, but seeing how I live in a glass house I’ll save my stone casting for myself. Remember – love makes the world go round, and you my friend will be better for it. Once you have lived in Bloomington this behavior makes sense. Sad story that extreme values & good intentions often become the problem for both sides of these neighbor wars. No one wins when pride and hatred sore the hearts of good people. Wars as old as Cain- “my idea of what to do with my land is better than yours. And I will force you to see it like I do.” I wouldn’t want to be the one to pull the trigger Mayor McArthur. I live in Bloomington Ranches and could not be more ashamed and embarrassed by these actions! Please don’t judge us all by the actions of these hypocrites! These people act like spoiled kids. Affluent neighborhood??? HAHAHAHA Have you seen Bloomington lately? ERADICATE Bloomington! Attention, Bob Cheek: Did you get a good look at what someone did to that house and the contractor’s trailer? You DO have vandalism in the neighborhood. Judging by which property was affected, it’s very likely someone you know, who supports your efforts to get rid of this facility, who did the damage. I’m an Addict in Recovery, whos been Clean for 3 years, and who also went through a treatment center here in St. George. Upon entering treatment we need to feel safe, we are trying to help save our own lives! Makes me very sad that people would terrorize individuals who are trying to survive and arrest this disease, so they can find a new way of life! We all deserve a chance to be a part of this world, ultimately…. This is a disease that kills, who would deny someone the right to live?! Breaks my heart. This makes me shake my head. I am a recovering addict and have been for the last 5 years. My life today has not the slightest resemblance to my life when I was on drugs. When I was using I had no hope for my future I was alone and afraid and didn’t want to go on living but I didn’t want to die. Some miracles happened in my life and if it wasn’t for places like this my life wouldn’t have been saved. I just wanted a way out but I didn’t know how to get there. Places like this show people like me the way out. Places like this free peoples broken souls and show them how to live happy lives, something so foreign to an addict that most people just can’t understand. Today I have loving relationships in my life. I am part of society. I have a college degree and am on a successful career path, but more than all that I am comfortable with myself today. Today I want to live and I know hope. Mike, I was not judging anyone and I apologize if you or anyone else thought I was. I truly just want to hear from the residents that are opposed to this facility that thought committing a crime against this place was the proper thing to do because they don’t want this facility housing people that might commit crime in Bloomington. It seems to me that the only crime that had or will occur because of this place is being done by some select residents against the place. How do they suppose anyone will take those concerns seriously now? I just want an answer from anyone to explain this to me and the rest of the community. It is difficult to convey my tone correctly here but I am not saying any of this with anger or attitude. I am simply asking a question. What i would like to know, is how you know, it was a resident of Bloomington. Jorgenson knows hundred of drug users, some he maybe chasing for money. He had just let his night watchman go, maybe it was him. Maybe facts should be present before making accusations. Just maybe he want insurance money, lots of maybe’s. If you cant think for yourself in such a one sided article, maybe you should not be commenting. The people who did this vandalism and others who threatened to burn the house down are much more of a threat to society than any of the residents at a treatment home could ever be. Angry people who are “anti” anything and willing to act out, are the biggest threat we have. Glad these vandals are not in my neighborhood! I understand that the mayor should take a look at his own property before he sends anyone out to look at the reward sign. I see the sign as “free speech” issue. Cheeks said, “it makes it seem like we have vandalism in the neighborhood.” Well Mr. Cheeks apparently you do have vandalism in the neighborhood. I wish you and others that look at this house as bad thing would educate yourselves before you took action. These addicts in recovery are looking for help, for a new way of life the greatest thing we can do in this life is be of service to others. In loving, we learn love. No one wants a “drug rehab” in their neighborhood, BUT if they have a loved one that is in need of addiction help, that’s another story isn’t it! This is a business, there are zoning laws for businesses. Guess what, businesses are not allowed in subdivisions. Keep up! Commercial zones allow for this type of business, no one is saying that addictions should not be treated, there is a place for everything. As far as the facility, I could take it or leave it, but let’s get one thing straight. The addicts are not Americans with Disabilities. And they don’t have a “disease”. I know a guy who finished treatment last year and he is far from diseased or disabled. The guy just drank way too much, and now he doesnt. The author states that the ADA “provides legal protection for residential treatment facilities.” This is not true. The ADA prohibits discrimination in housing against disabled persons. A treatment facility is not housing in either a legal or factual sense. It is no more housing than a hospital is. The existing case law related to the ADA as it applies to treatment facilities for addiction is vague and inconclusive. Statements by city officials that the ADA is forcing their hand in this matter is based on faulty legal advice by the city attorney. Those who are fighting the treatment facility in Bloomington have a legitimate legal argument that should be heard in a court of law. The city does a disservice to these residents by not backing them in this case. I’m not judging either side of this issue, however, regarding the idea that the reward sign was put up, did the residents of Bloomington get city approval for all their yellow signs around the neighborhood? Just wondering. Perhaps they did. But if not, than they have created their own broken rules about signage. 1. I am not at all in favor of anyone using vandalism or force regardless of which side they are on. 2. I understand and accept that a lot of good people find themselves in bad situations. Sometimes the bad situations result from bad choices. Regardless of the cause, compassion is a good thing. 3. If the people who are ready to grab pitchforks in counter protest, stop and think, they should be able to understand why some people wouldn’t want this kind of facility next to their house. I am familiar with another facility in St. George where one of the residents re-lapsed and then mistakenly entered the home of a neighbor in the middle of the night. Fortunately no one was harmed. But is it a stretch to think that someone under the influence of drugs or alcohol who mistakenly enters a home in the middle of the night might harm the occupants? 4. Is it possible to call someone self-righteous without being self-righteous? My sisters neighbor from down the street had a little too much to drink and walked into my sisters house last month. Funny thing is she does not live anywhere near a treatment facility. Maybe, just maybe some things can happen in any neighborhood even when you don’t have a treatment center to take the blame. But that is logic, like putting a sign in front of a house that was vandalized, and the problem with it is it will make the neighborhood look like is has vandalism. Or Mr Church saying he does not agree with vandalism, but it does not surprise him his neighbors would do it. he has such a high opinion on who he lives next to I hope he does not take up a cause that puts him on their bad side. Way to go Bloomington stake Mormons. Your true colors are showing. I missed the part in the article that said the person was from Bloomington, or was a morman. Maybe you could fill in what you know. I lived here for 7 years in the 90’s. I moved away and have been back for two years. There are a few reasons I am not Mormon. 1) I was looking for God and I was up North with my ex husband and his family and we are at the church up there and I wasn’t allowed in. I didn’t know God but I was searching and right then I said THIS IS NOT GOD. God would let me in. 2) The Mormons have their own book. 3. The first time I saw a polygamist family I was terrorized. I have learned to not be terrorized by polygamist but I wont forget my first encounter. Kara you bring up a quote from the BiBLE…I don’t see Mormons reading the BIBLE…I see them in the break room reading the BOOK OF MORMON….however, lately I have been bringing my Bible into the break room. I am not Mormon, but I am a believer in Jesus. Jesus is my Lord and Savior, He died and rose again the third day and sits at the right hand thrown of the Father, I am a sinner saved by grace and everyday I need his Mercy and grace and forgiveness because I am a sinner, I am not sinless I am not Jesus…I mess up….i ONCE WAS BLIND BUT NOW I SEE. And being denied access to the Mormon church was part of my journey. Mormons are people too, they are sinners and they need to be saved by grace like everyone else. They just don’t see that, they are blind. No different than any other non believer. My son is a meth addict. My son needs to be saved too. I’m confused. First, this article is about a treatment center for addictions. What does your opinion on the LDS church have to do with this article? Second, non-members are not allowed in the temple but they ARE allowed, even welcomed, in a general meeting house. Also, Mormons DO read the bible. In fact, the new testament, old testament, the book of mormon,, and doctrine and covenants are often bound together. Finally, the polygamists that you are referring to are members of the Fundamentalist Church of Jesus Christ of Latter Day Saints (FLDS) not to be confused with the actual LDS church. Practicing polygamy gets you excommunicated from the Mormon church. But again, what does any of that have to do with this article? EVERY time an LDS missionary has shown up on my doorstep, I invite them to discuss the Holy Bible with me. They can’t. They have very little knowledge of what is contained in the Holy Bible. They do, however want to discuss their cult book of mormon. I have read that cult book and it is good for laughs. Now the Jehovah’s Witnesses, on the other hand are VERY WELL Versed in the Holy Bible. When my brother came home from his mission our stake president quoted the bible and my brother, without looking it up, was able to recite the location of said scripture. Remember YOUR experience-is just that-an experience. Its not fact. If missionaries can not discuss the bible than they aren’t very good missionaries. That doesn’t mean that ALL missionaries are like that. Way to generalize and assume. Not a religious issue moron! so what about polygamists “terrorized” you? You sound like a very confused “Christian”. Plus you sound like a ranting fool. My name is Mike Jorgensen. I am the owner of Steps Recovery Center and am the person who is opening the Residential Treatment Facility in Bloomington. I feel I should jump in on this discussion and hopefully clarify two important points. First: While most of the neighbors who oppose our facility are LDS, (most neighbors in Utah are LDS) they are not a fair representation of the local LDS Ward or Stake. Nor do I believe their actions and behaviors reflect the teachings or beliefs of any mainstream religion. I have communicated with the Bishop as well as a member of the Stake Presidency, (who may or may not be running for Mayor) and even though they both had personal concerns about our coming to their neighborhood, they both treated me with respect and kindness and acknowledged their ecclesiastical responsibilities to our Clients, Mormon and non-Mormon. Second: The organizers of the protest against our facility are but a small handful of Bloomington residents. So many more of the Bloomington neighbors have reached out, welcomed us to their neighborhood, and have expressed their support and appreciation of programs like ours. We should not judge an entire community based on the actions of a few misguided, but well-meaning individuals. I am humbled, honored and grateful for all of the support I have received. I acknowledge and respect the opinions of those who oppose me. My hope is that both sides of this debate find love and tolerance toward each another, and respect the rights of those who have an opposing point of view, regardless of their financial status and religious affiliations. Mike, i am glad you have at least taken religion out of this discussion. It is to bad your place was damaged. With that said, why, with hundreds of people in the comunity apposed to what you are doing to their community would you do that to them. Everyone agrees, there should be places like this for people, however, putting it in a subdivision is just plain stupid. You appear to be a selfish narcisist putting a large business in a subdivision. There is no security, putting 30 people in a house has impact, visitor and employees will increase traffic in a neighborhood with small children. If it wasn’t for a law passed for different purposes, it would be illegal. This is a 200k dollar a month business, with 6 employees, certainly you could afford other places more suitable. Maybe next to your house, oh wait i was at a meeting where 6 people said that you said you wouldn’t want it in your neighborhood. Business should not be in residential neighborhoods period, otherwise, first it is your business, next its a jack in the box, just like a law meant to protect people that couldn’t walk now is protecting people who chose to put needles in their arms. Destroying a neighborhood for your personal gain is wrong, you know it, and everyone who thinks about it with honesty knows it as well. “People said that you said”. You can’t even use that in court. It is called hearsay. As an addict in recovery myself I have a hard time defining addiction as a disease. It seems like a cop out to me. For myself and my recovery I dont use that term.. but yes in terms of professional psychology and medicine it is defined as a disease. I own apartment complexes and have been sued by a city for allowing drug user into my apartments. Yet apartments are not allowed in residential neighborhoods. Now, how does this make since, first the city allows apartment living in residential neighborhoods now as long as they are drug addicts? It appears they want drug addicts living in residential neighborhoods stacked up. If only there was a solution? Morons! The article does not cover the bigger story. It’s written to cover up the true travesty. It’s now legal to convert a half million dollar home in a residential neighborhood into a 200k dollar a month income business. That business would then be worth, let’s see, to get appraised value is, 200k times 12 equals 2,400,000 then times ten years equals 24 million. There’s the story, “Man takes 1/2 million, dupes the city and residents and makes 20 million”. You mean someone is mad? Really? Laws need changed, apartments should not be allowed in residential neighborhoods, even if they are full of drug users or should i say especially if they are full of them. This helps no one, but the owner of the drug center to continue to make money by exploiting cities and people who own houses nearby. Care to explain the insult, since the insult you cast is about my ignorance, why dont u care to bring me up to speed on your superior understanding. Given that all the info i gave was fact, I’d love to hear it. You know the last time I was in Purgatory I couldnt help but to notice an increase in the amount of heroine and oxycontin addicts in there with me. I wouldnt have taken notice ordinarily except that these young kids were always on the phone trying desperately to get bailed out. And their mothers were so upset that they had to drive all the way from Bloomington to pick them up from jail. O ya I’m sure the parents of the drug addicted young people were absolutely distraught about the drive..